I can take advantage of living in London to visit the city itself, but also the other places around like Stonehenge, Brighton, Oxford, Cambridge, Canterbury… Maybe I will never come back, so it’s now or never! 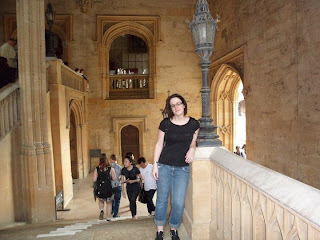 This weekend, I went to Oxford, a real lovely town just 1 hour by train from London. I am sure you know this town because of its university, which is famous all over the world. As for me, another reason made me go there: do you know Harry Potter, the small wizard who studies at Hogwarts School? (the name is Poudlard if you read it in French, I don’t know if the name has been changed in the other countries). The producer was inspired by Oxford university to shoot some scenes of the film. So if you want to see some of the best sights England has to offer, book a ticket to go to Oxford! However, you don’t need to be interested by Harry Potter to visit this town full of beautiful colleges and churches and pace up and down the pavement. You can visit the Bodleian library and Christ Church Cathedral, which inspired the producer of the film. In the latter, you will see the stairs were professor McGonagall was standing on to welcome the first year pupils during the first film. You will see, as well, the dining room from the films. (No parts of the film were actually shot there but the producer used the original tables and chairs and reproduced the set in his studio). It was amazing! I took so many pictures. I was really impressed by this dining room and these long tables. However, the dining room is not as big as in the film and there is not four but only three rows. Moreover, there is no ghost, so no chance to see “Nearly Headless Nick” (Nick quasi-sans-tête) or Moaning Myrtle (Mimi Geignarde)!! Nevertheless, you should visit this place. Unfortunately, you have to pay to visit these places but if you are a student at Twin or another college, you will receive a discount on the price. Christ Church is also well known because Lewis Caroll, the author of Alice in Wonderland, studied there. If you want to follow Harry Potter’s steps, you can also visit New College. Do you remember the second film when Ron and Harry miss the Hogwarts express? (or Poudlard express for french people). They took the flying car of Ron’s Dad and when they arrived at Hogwarts they land in a tree, you will see this tree! I really enjoyed spending time in Oxford and feeling in another world for one day. The English architecture is really dfferent from my country and each time it surprises me. A last tip before you go there, print a town map! It is very useful to help find the places you want to visit. If you go to the tourist office, they will ask to you pay for the same map you can print for free online. Enjoy your trip in Oxford.